A device for measuring nasal air flow rates. A neurosis or functional disease of the nose. A process on the aboral side of the eye of certain molluscs, with supposed olfactory function. 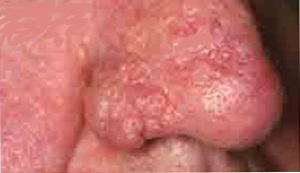 A redness and deformity of the nose occurring almost exclusively in elderly men: Rhinophyma is a complication of a severe skin disorder of the nose and cheeks in which the small blood vessels enlarge and the sebaceous glands, which produce oil for the skin, become overactive and make the nose very oily. 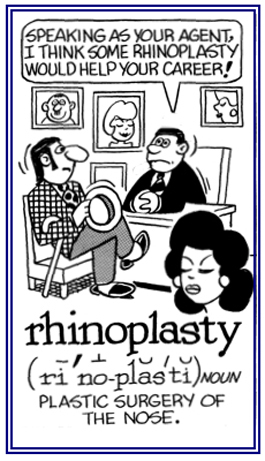 A reference to the reconstructive, or cosmetic, surgery of the nose to correct its shape or function. 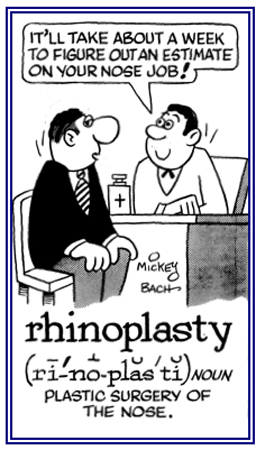 A medical procedure that alters the structure of the nose to improve its appearance or to correct a deformity that is caused by injury or a disease: Rhinoplasty may cause considerable bruising and swelling, and the results of the incision may not be clearly visible for weeks or months. Rhinoplasty is also known as a "nose job" or reconstructive surgery, that is used to improve the function or appearance with cosmetic surgery of a person's olfactory nerves or nasal cavities. 1. Inflammation of the mucous membranes of the nose and lung in animals. 2. Any of three similar contagious disease of horses, caused by herpes viruses and characterized by rhinitis. 1. Nosebleed; epistaxis (hemorrhage from the nose). 2. Nosebleed, especially a profuse one. 1. An operation performed by excising a fold of skin from the nose and closing the opening with sutures. 2. A plastic reduction in the size of the nose, in which redundant nasal tissue is removed by section, followed by approximation and suture of the wound edges. A discharge of a watery or a slimy substance from the nasal mucous membrane: A rhinorrhea is the discharge of cerebrospinal, or the brain and spinal fluid, through the nose following a head injury.